Vimy, April 9th 1917, 5:30 a.m. Twenty thousand Canadian soldiers advance towards the deadly fire of enemy machine guns. Snow and hail whip their faces. The ground is muddy, cratered and crisscrossed with barbed wire. And yet, they will emerge victorious. And a recent acquisition of the Canadian War Museum will rekindle the memory of this decisive battle. Almost 20 years after the events of April 1917, 100,000 people, over 50,000 of them Canadian, British and French veterans, were reunited on Vimy Ridge. 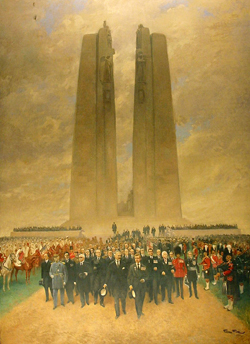 All had made the journey in order to take part in the official inauguration of the Canadian National Vimy Memorial, erected in honour of the brave soldiers who would return in triumph…and of those who never made it back home. It is with great pride that all of the Canadians present displayed the Vimy Pilgrimage Medal. Crafted from a bronze alloy plated in silver, the medal was commissioned from the renowned badge-maker J.R. Gaunt & Son Ltd. by the Royal Canadian Legion. It was issued to mark the participation of veterans and their families in this momentous voyage. Another important figure also wore the medal – King Edward the VIII. He had been offered a ‘royal’ version of the medal, in 10K gold, which he wore at the unveiling of the monument. In an article published in December 1936, the Canadian Geographic Journal, noted that “His majesty was dressed in formal morning attire. On his left breast he wore the many decorations and war service medals he earned two decades ago, and on the right lapel the Vimy Pilgrimage badge. This was noted keenly by the pilgrims, who were not lacking in appreciation of this evidence of royal thoughtfulness.” It was the very same medal which now makes its official debut at the Canadian War Museum. A long and chaotic road separated the ceremony of July 1936 and the medal’s official presentation to the Museum on January 20, 2011. One must remember, of course, that only a few months after the inauguration of the Canadian National Vimy Memorial, Edward VIII abdicated the British throne in order to marry Wallis Simpson, an American divorcée. He subsequently became the Duke of Windsor and never ceased to express his undying devotion to his Duchess, lavishing her with jewels from the finest houses such as Cartier and Van Cleef and Arpels. After spending the remainder of his life in relative exile, in France and the Bahamas, the Duke died in Paris in 1972. In 1987, one year after the demise of the Duchess, her impressive collection of jewels and other personal effects were put on auction at Sotheby’s with proceeds going to the Pasteur Institute. The Vimy Pilgrimage Medal purchased by an anonymous bidder was amongst the personal memorabilia of the Duke of Windsor, which included swords, medals, military buckles and buttons. On November 30th 2010, the medal reappeared at a new auction. Aware of its historic significance, the Museum acquired it for nearly $20,000 – thanks to the generous support of the Vimy Foundation. This historic medal, which made the pilgrimage from Canada to commemorate the courage of our troops, has finally returned home…as a potent symbol of the respect the King conveyed long ago to Canadian veterans – for their valiant exploits and sacrifice in service to their country.